Little Snowy, a one-year-old white West Highland terrier, weighs just 3.6kg (8lb) but still found room for the five ornaments. 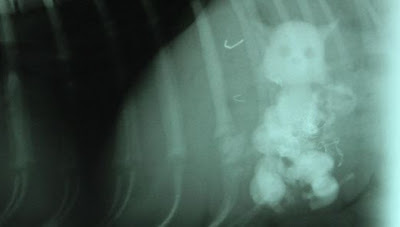 The vet initially thought it was a joke when X-rays clearly revealed a cat peering out of the dog’s belly. "We were all stunned. I have been a vet for ten years and never seen an X-ray like this," said Nigel Belgrove, a partner at Cromwell Vets. "We’ve had dogs that have swallowed golf balls and batteries before but Snowy beats them all, hands down,’ he added. The terrier began to worry her owner Samantha Reed, 42, when she suddenly lost her appetite and started vomiting several times a day. Initially, it was thought Snowy had reacted badly to dog food and the vet recommended a diet of rice and chicken. She remained ill so they took urine samples to test for a kidney problem and tried a course of antibiotics. It was only when they took the X-ray that the feline face emerged. The cats were removed last week in a one-hour operation and Snowy is now recovering well. She was lucky not to suffer permanent internal damage and vets said she could have died if the toys had reached her small intestine.